When you add a new friends list to Facebook Chat, it is automatically configured to be displayed, even as you have not added any friend to it - in effect, Facebook is showing an "empty friends list". If you decide that you no longer need a friends list (after you made them actually useful by adding friends to them of course), you have two options: you can either permanently delete the friends list, or -as you'll learned in the previous tutorial- you can simply hide them, temporarily (how to hide a friends list from Facebook Chat). And you can restore and show hidden friends lists with just a couple of clicks. 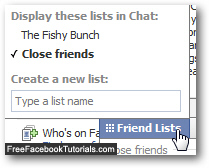 In our case, the first friends list shown is hidden; to display a hidden friends list in Facebook Chat, simply click on its name inside the listing, and three things will happen: first, Facebook will apply the new setting (immediately), and hide the chat client; then, it will add a checkmark next to the friends list you just chose to unhide; finally, it will resume showing the previously hidden friends list back inside the chat client. Just click on the "Chat" button to confirm that. And if you were to click on the "Friends Lists" button once more, you'd be able to see that the list is now checked, and its name printed in bold characters in the listing. And that's how quickly you can unhide hidden friends lists from Facebook Chat! These free Facebook tutorials were written for the new Facebook, and are updated with each latest version of your favorite social networking site on Windows and Mac.